Levee reconstruction can be jarring to communities. It certainly brings inconvenience, but it can also cause financial hardship. So, when FEMA (the Federal Emergency Management Agency) released new water models for this region, many communities experienced the shock of discovering their current flood protection was not adequate to be recertified. Hundreds or thousands of homes that were previously outside the flood plain were now inside it. The impact? The homeowners finding themselves in the redefined flood plain would be required to purchase flood insurance. Or, the community would need to go through a complex and costly upgrade to its flood protection. 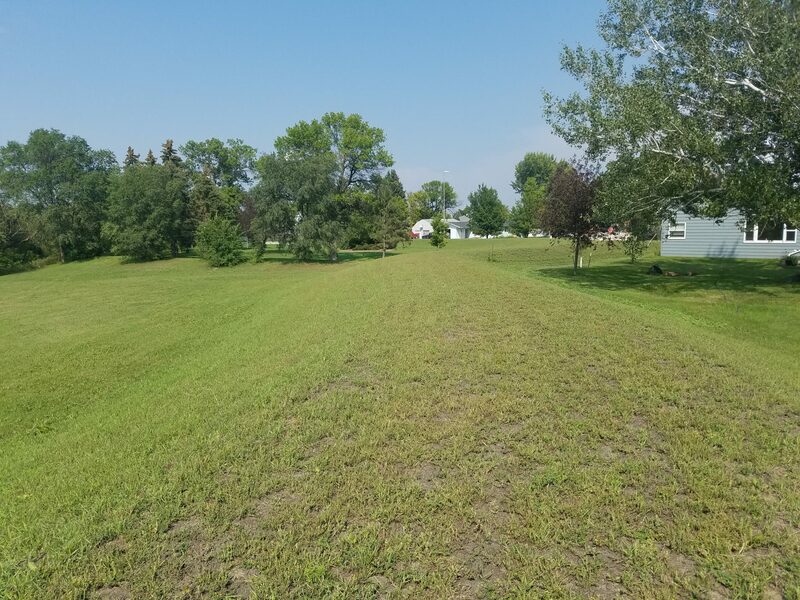 Mapleton, N.D., for example, found several stretches of its current levee were just inches short of FEMA’s minimum freeboard requirements because FEMA updated the 100-year flood level of the Maple River. We couldn’t just use Mapleton’s stream gage for flood frequency analysis because the river behaves differently since 2006, when the Maple River Dam was built. Without a long, consistent previous record, we are unable to statistically show how the river will perform today with a high level of confidence. However, with regional stream gauges, we statistically demonstrated that the current flow characteristics of the Maple River in Mapleton correlate very well with the historic gage data of the Rush River in Amenia, N.D.
Mapleton’s levee was originally built in 1998 with 3.5-5 feet of freeboard, or 3.5 to 5 feet above the projected 100-year event water surface elevation. This exceeded FEMA’s minimum standards. With FEMA’s updated study, the levee suddenly was at risk of becoming non-accredited. 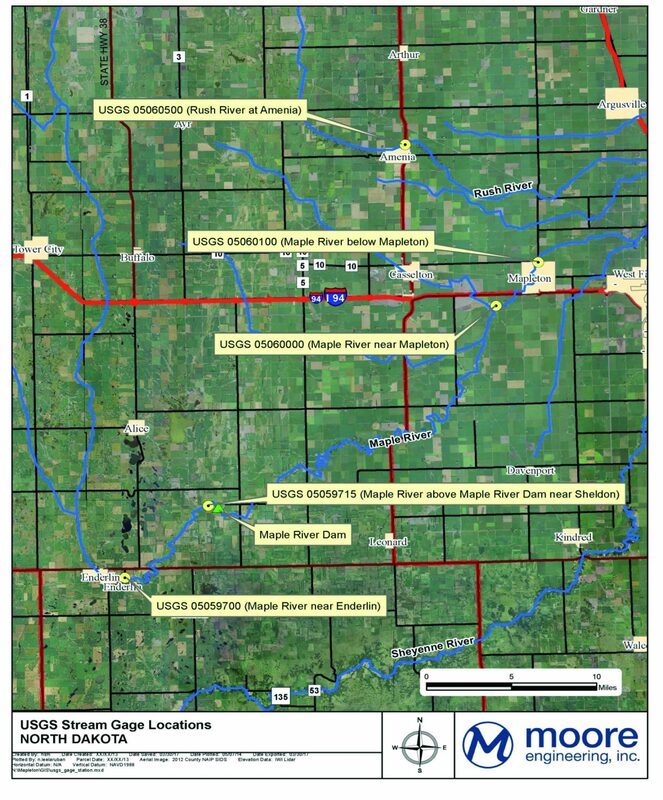 Mapleton’s levee was at a 100-year plus 2.75+/- feet in many locations. This meant the city would have had to spend hundreds of thousands of dollars raising their levee just inches to meet the minimum freeboard. Moore looked at the situation and brainstormed how to guide Mapleton through this potential crisis. We decided to look at stream data to attempt to receive an exception to the minimum riverine freeboard requirement, which FEMA allows if appropriate engineering analyses are demonstrated. 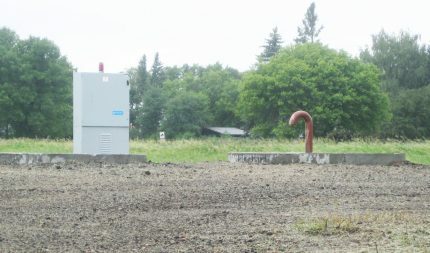 But we couldn’t just use Mapleton’s stream gage for flood frequency analysis because the river behaves differently since 2006, when the Maple River Dam was built. Because we lacked a long, consistent previous record, we are unable to statistically show how the river will perform today with a high level of confidence. However, with regional stream gauges, we statistically demonstrated that the current flow characteristics of the Maple River in Mapleton correlate very well with the historic gage data of the Rush River in Amenia, N.D.
We used Rush River at Amenia, proving it correlates well with Mapleton, to show that the 500-year event exceeds the 100-year flood’s 95 percent confidence interval upper limit.We essentially modeled a bigger flood event than what we’re certain could occur in Mapleton and found the current flood protection met the standards for recertification. With data from that stream gage, we demonstrated the 500-year flood discharge exceeds the 100-year flood’s 95 percent confidence interval upper limit. Since an exception can be granted down to a minimum of two feet of freeboard if the modeled discharge uses a 100-year flood’s 95 percent upper confidence limit (not available in Mapleton), we requested FEMA to consider using the 500-year flood profile (available in Mapleton) plus two feet of freeboard for Mapleton’s levee recertification. Explained a bit more simply, we used Rush River at Amenia, since we had enough data, and we proved correlates well with Mapleton, to show that the 500-year event exceeds the 100-year flood’s 95 percent confidence interval upper limit. Even more simply, we modeled a bigger flood event than what we’re certain could occur in Mapleton and found the current flood protection met the standards for recertification. FEMA agreed and granted the freeboard exception, verifying the validity of our statistical analysis and modeling. The city did need to raise portions of its levee, but much less than if the freeboard exception hadn’t been granted. Best of all, once the recertification report is approved, residents will still not be required to purchase flood insurance for their homes. If you would like to discuss your city’s flood protection and what FEMA’s new water models mean to you, please contact us. We’d love to chat.